Photograph of Mr. Bhavin Turakhia, co-founder and CEO of Zeta during the a launch event of the products today. 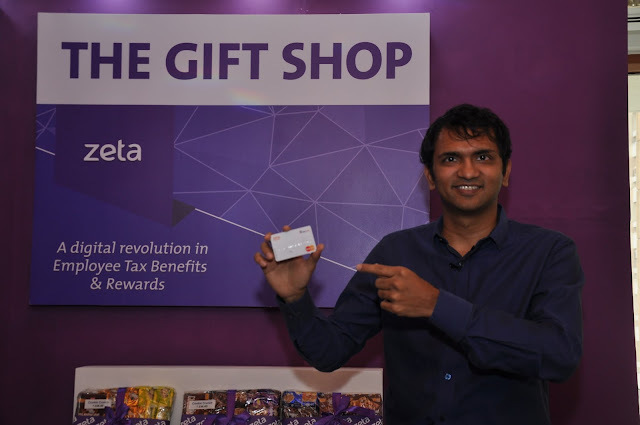 Photo Caption - Mr. Bhavin Turakhia, co-founder and CEO of Zeta unveiled 3 new digital solutions in the Employee Tax Benefits and Rewards space. How does Zeta do this? Zeta provides an end-to-end solution for companies to manage their Employee Tax Benefits and Rewards programmes electronically. Using a single web-based interface, an HR Manager is connected to every employee’s mobile phone. And at a click of button, HR Managers can send grants of meal vouchers, medical reimbursements, gifts etc to all their employees, across cities, instantly. These grants are transferred to an employee’s cloud-based Zeta account in the form of multiple virtual cards - each card representing a specific tax benefit and can be used only to avail that specific benefit. For eg: If an employee receives medical reimbursements grant in a virtual medical card then the money granted here can be used only towards medical purchases. This ensures that the user has the convenience of accessing all his employee benefits in one place while adhering to the respective company policy. Employees can access the grants and transact via the Zeta app on their smartphones or via a physical MasterCard-powered - Zeta Super Card - both of which are linked to his Zeta account. Employees can also upload bills as proofs of purchases on the Zeta app itself. These bills are verified and safely stored by Zeta for up to 7 years, freeing the HR Manager of these mundane tasks and any audit issues. Zeta’s solution can be used by any corporate irrespective of the employee strength or location and an HR Manager can set up Zeta in under 5 minutes. Earlier this year, Zeta introduced its electronic meal voucher solution - Zeta Meal Vouchers. This solution has seen rapid acceptance in the market with over 200+ corporates across industries already using this product. The Zeta app is available on all popular platforms like Android, iOS and Windows. Zeta is an emerging player in the space of mobile and digital payments. It is on a mission to make payments cashless, convenient and inclusive. Zeta has started this journey by launching enterprise cloud solutions for HR Managers that entail end to end management of employee tax benefits that are run digitally. The uniqueness of all Zeta products stems from the fact that they originate in the lap of extremely advanced technology. Zeta is the latest venture of Directi, founded by serial tech entrepreneur Bhavin Turakhia. Directi is a conglomerate of tech companies having a presence in India, US, China, Dubai and Europe. Bhavin Turakhia (CEO) and Ramki Gaddipati (CTO) are co-founders of Zeta. To know more on Zeta, log onto www.zeta.in or follow @ZetaIndia on Facebook and Twitter.